In the vipassana meditation tradition we are taught to focus on the breath. Why? Aren’t there more interesting things to focus on? Certainly there can be. Take listening, for example. Yesterday in class we sat outside in the cool morning air and did a listening meditation, as if it were a symphony. There were many distinct sounds: sawing, hammering, traffic noises, bird calls and more. Each was like musical instrument playing its part. It was a magnificent symphony. A listening meditation is lovely when there is rain. It’s also good for in a public space, like at the gate waiting for a flight at the airport. 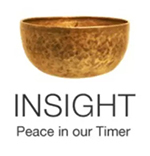 I remember in 2003 in the lead-up to the Iraq war, sitting with other meditators organized by the Buddhist Peace Fellowship as all the peace marchers assembled at the foot of Market Street in San Francisco. What a listening meditation that was! The sound of voices over a microphone rallying the troops, the conversations of nearby marchers getting together, the rustling and footsteps that passed by around us. When the march began we rose to take our part, feeling focused and united in purpose. We were the peace we wanted to see in the world. Even sitting inside in a quiet room there will be sounds to listen to: the heater, the refrigerator, someone clearing their throat or coughing, some rustling perhaps, a cell phone going off (oops! ), and allowing the sounds to be a symphony rather than an annoyance is skillful. In my poetry classroom at College of Marin, we have a wall of glass facing a busy street near a fire station. Last week during the four-day annual poetry intensive, I found myself coming into relationship with that sound and here’s a poem I wrote. all beings to be well? Sometimes the most dominant sensation might be a pain in the body. If we spend time with that sensation we can notice a ‘symphony’ of more subtle sensations. We see that what we have been labeling ‘pain’ is not one solid experience but an ever-changing arising and falling away of a whole series of sensations, each one tolerable and even kind of interesting. This is not to make light of pain. I deal with chronic pain a lot in my life and at times it can feel overwhelming. But it has helped to recognize that much of the agony has to do with how I get lost in thoughts about the pain rather than really paying attention to the micro-sensations that compose it, how they arise and fall away, get stronger and softer, appear and disappear. But generally, for most of us most of the time, as things settle down at the beginning of our practice, aches and pains are not dominant. If they are present, we sense that there are also other sensations going on in the field of our experience that are pleasant or neutral. We don’t replace one with the other, but we just notice the full range of sensation within our field of experience. And then, if things are relatively quiet and other sensations are reasonably mild, as we pay attention, we begin to notice, even if we haven’t been directed to, that the breath is the most dominant experience. And, not only is it dominant, it is ever present. It is the most reliable sensation we have. As long as we are alive, we have breath to focus on. The rhythm, pace and depth may change but the breath carries on. Dependable. And potentially very interesting. A perfect focus. Vipassana: Awareness of the breath. Many people come to vipassana practice from other traditions, and I encourage them to experiment with focusing on the breath, but to also feel free to use whatever skillful means they have in their meditation ‘toolbox’ to bring themselves fully into the present moment. I came to vipassana meditation over twenty years ago after many years of other forms. I found focusing on the breath a challenge in part because my mother died of emphysema and her last years were a painful struggle for breath, so focusing on my breath brought up my grief. It took me nine years to have the aha! moment when I realized that MY lungs were healthy. MY breath was fine. But even though it became easier, it still didn’t always feel compelling, and sometimes it felt dull, even boring. But I stayed with it because I know that ‘boring’ is just a label I was putting on it, that in fact it was a rich experience when I really paid attention. And now, all these many years later, I am having a new relationship with the breath, one that recognizes that as long as I am alive my breath is my constant companion, my most intimate, reliable and supportive friend. And so I have been writing odes and love poems to my breath! Here are some examples. I rest there, gently rising and falling. is both relief and rejoicing. bird song, car door, heart beat. So I encourage you to investigate your own practice with whatever is the most dominant sensation at the time. And befriend the breath! If you are religious, recognize all the spiritual words (even the word ‘spiritual’) assocatiated with breath. If you are more scientifically inclined, then the focus on the physical process that keeps your body alive and connected to all life is a wonderful place to ground your practice. Explore and enjoy! This entry was posted in breath, listening, meditation practice, meditation techniques, poem, Vipassana on July 24, 2016 by Stephanie Noble. Last week we explored the various qualities of silence and learned how to develop a deep loving connected sense of silence that allows us to hear the patterns of our own thought processes. This gives us two useful skills as we begin to interact with other people: First, we are developing an awareness of the repetitive nature of our thoughts. When we see them for what they are, we also see that we do not need to say them out loud. They are just the flotsam and jetsam of our brain’s synaptic processes. If we’re not aware of the repetitive nature of our thoughts, we are probably not aware of the repetitive nature of the things we say, those comments we make over and over again about things we see and situations about which we have set opinions. It does seem an unfortunate truth that as we age, without developing increased consciousness, we are more likely to repeat ourselves, much to the dismay of those around us. Here’s an example I used with my students. From our living room looking out across the valley, I can see a house that stands out like a sore thumb in my opinion. So my thoughts go something like, ‘Why did they paint that huge house that color? Maybe I should write them a note before their next paint job to remind them that a less garish color might…” You get the picture. It’s skillful for me to notice that I have this repetitive thought, and skillful to let it stay a thought, to leave it unexpressed. So that’s what we bring from silence into Wise Speech. We are not censoring. We are simply being compassionate. If it bores us to think it, it’s going to bore someone else to hear it! Secondly, when we develop a quality of loving silence we can more easily develop the skill of engaged listening. Listening to others without an agenda is the most skillful means of developing connection in any conversation. Notice when you are in conversation where your mind is when you are listening. Are you really listening? Or are you preparing your response? Engaged listening means letting go of the need to prove we know something or that our position is the more secure one. We might notice a sense of feeling threatened by someone else’s opinions or statements. What is it that is being threatened? Our sense of separate self that we believe we need to shore up and defend? Time to revisit Wise View. We might notice that sometimes we listen with a hunger to be entertained, to have our curiosity satisfied. Perhaps we are so used to watching television, plays or movies or reading books that we are passively amused or stimulated by what we hear, even when it’s a friend or family member who is talking. Or if we are not passive, our curiosity might demand to be fed, and we might ask questions that are intrusive, unlike ones that make people feel heard and foster understanding. There’s a quality of mutual respect in the process of listening, a quality of namaste, loosely translated ‘The god in me honors the god in you,’ It acknowledges that we are all the same stuff at the core of being, and all the distinctions and differences are creations of our minds. This does not mean that our experiences are the same, or that we can make any assumptions about the other person, but it does create a more spacious way to be present in the conversation. Some of us are antagonistic listeners, actively looking for the loophole, the fatal flaw in the other person’s words, as if all conversations are political debates. Notice if in conversation you tend to break into a person’s sentences, use the word ‘But…’ when doing so, as if there will be some tally of points in the end about who is right. If so, take a cue from the tradition in improvisation theater where each actor dives in with, ‘Yes, and…’ so that the result is a wondrous collaboration instead of a trashing of each other’s ideas. If you find that you are scanning what you hear for errors and faulty reasoning, you are not listening. Give yourself permission to rest that over-active fault-finder. Listen with your whole being. We might feel that we are listening in a loving way when we are actually on a problem-solving mission. This person is not your problem to solve. Fixing them is not your job. So you can see that Wise Speech is not just about talking. It’s about resting in silence, noticing the nature of our thoughts, and developing the skill of really listening to others when they speak to us. SPECIAL HOLIDAY TIP: If you have a person with whom you have a particular challenge and somehow the words always feel wrong, tap into metta practice, send loving-kindness to him or her before speaking. “May you be well. May you be happy. May you be at ease. May you be at peace.” Always give yourself some metta first. That will enable you to share it more easily. This entry was posted in listening, Wise Speech on November 25, 2013 by Stephanie Noble.